Railway Cottages & The Gables, Mealsgate. This row of cottages is located more or less opposite The George Moore Memorial Hall. This photograph was taken from the B599 near the old railway bridge, close to Mealsgate Station, looking down the road towards the A595. Click here for aerial views of this location taken in the 1980s. At the far end of the row of cottages is a sandstone building, The Gables, which was once a shop. 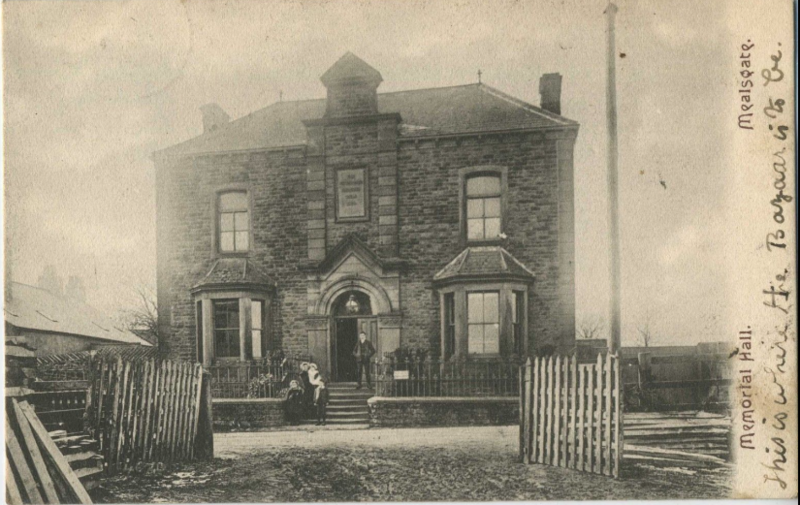 The postcard below shows the Memorial Hall (with Knapethorn to the left) before Railway Cottages were built on the opposite side of the road. This is the earliest picture of the Memorial Hall that I have come across. Someone added annotation in the margin which reads, "This is where the bazaar is to be." This image is courtesy of Mark Graham, old postcard enthusiast.